If any one person can be credited with sparking the video game industry, it is Ralph Baer. Born in Germany in 1922, Baer was expelled from school at age 11 because he was Jewish. Fearing violent anti-Semitism, the Baer family fled to America before the onset of the Holocaust. Instead of going to school, Ralph worked in a factory for 12 dollars a week, but made sure to learn on his own. During World War II he served as an intelligence officer based in London, stationed in France. After returning home Baer was among only a handful of people to earn a Bachelor of Science in television engineering, and worked for several electronics companies (including IBM) before joining Sanders Associates, a defense contractor which builds electronics for the military. 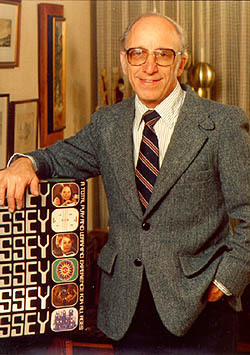 It was there that Ralph Baer began developing a gaming system in 1966. The prototype was complete by 1968, and in 1972 was released by Magnavox as the first ever home video game console, known as the Odyssey. Update: Sadly, Ralph Baer passed away on December 6, 2014. This entry was posted in Science & Technology and tagged Bachelor of Science, Engineering, France, Games, German Jews, Germany, Home Entertainment, IBM, Intelligence Officer, Light Gun, London, Magnavox, Military, National Inventors Hall of Fame, National Medal of Technology, Odyssey, Simon, Television, Video Games, World War II on September 19, 2012 by Jew of the Week.